GIVE ME ALL THE COFFEE i CAN GET! ONCE I HAD MY OVER-ENERGETIC CHILD, i NEEDED THE SAME ENERGY TO KEEP ME GOING THROUGHOUT THE DAY!I LOVE COFFEE, BUT MOST OF ALL I LOVE PRETTY COFFEE! hERE I HAVE PUT TOGETHER SOME FUN OPTIONS FOR YOU TO TRY OUT THE NEXT TIME YOUR'E LOOKING FOR A FUN cup of cappuccino! I know they are typically known for their delicious cronuts, however, they serve the well known Equator coffee, the Mocha here was to die for! And of course, coffee & donuts is a no brainer! The perfect combo! The thing about this place is, they also have three food trucks, so you can pick up coffee & donuts on the go on a weekday when rushing to work or they also have a newly renovated large space in San Rafael, so you can enjoy sitting down with your cup of latte and a yummy donut on a Sunday morning. 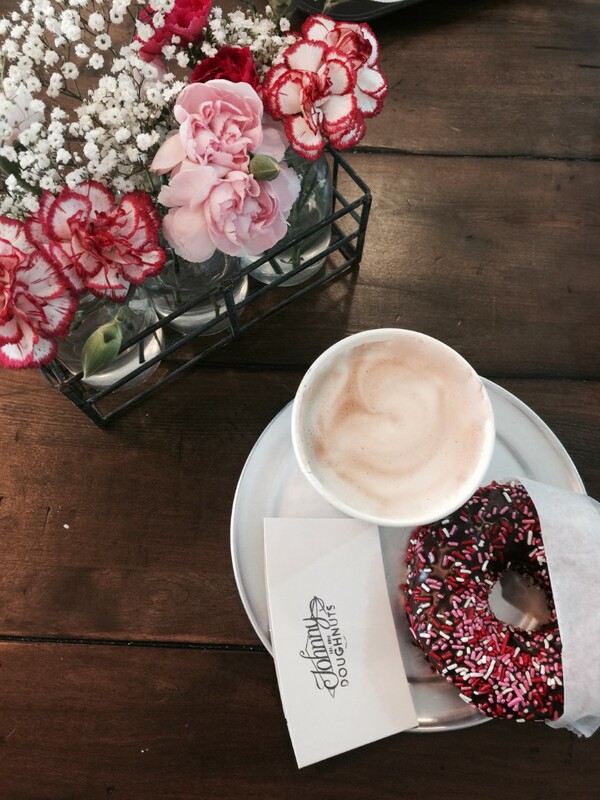 SIDE NOTE: They have occasional seasonal flowers like pictured above (Valentines Day Perks), to make your pictures more Insta-worthy! Ok, so the main thing here is the amazing pineapple wallpaper! I mean, come on that wallpaper and a cup of coffee in front of it has to create a statement Insta photo! I had been dying to go here, since I saw it on Yelp a while back, so when my friend from L.A (also a coffee addict) was visiting, we couldn't wait to catch up & snap away. Even there sugar and milk table had the trendy pineapple background as well as cute sugar cubes on a block of wood (I get really excited about the small details). We also got a photo shoot session outside, as its the perfect place to take a picture of (your outfit, duh) against a white wall & some trendy coffee shop furniture. We managed to get some cool boomerangs there too. Will post on my Instagram soon! Keep a lookout! This place is me and my mini's favorite little place to go when we head to story time, on Thursday mornings. We always go to the Larkspur Landing in Marin, however, they also have a few other branches. 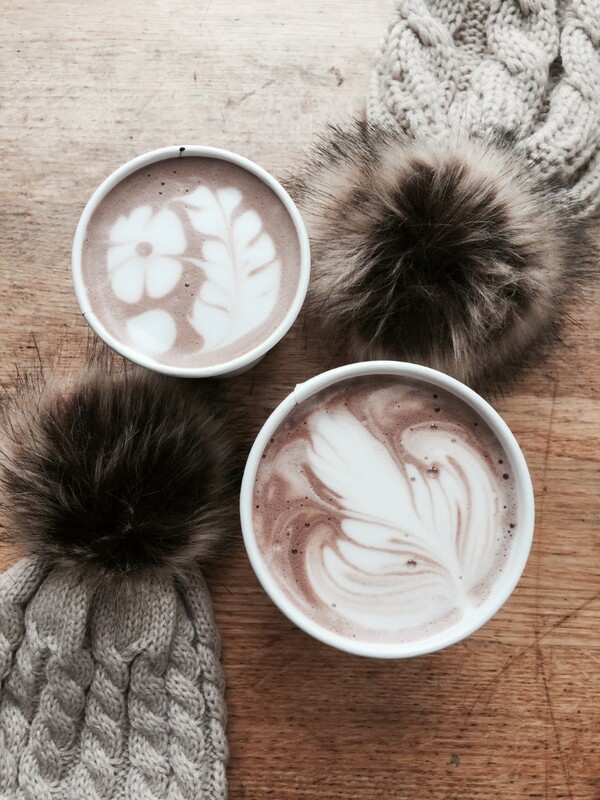 We always like to get a mini hot chocolate for her and a yummy mocha for me, while they put super adorable latte art. Last time we got a cute little flower (pictured above) while they also put things like a bear, a butterfly or hearts. They also do the most delicious oatmeal, perfect healthy breakfast when rushing out the door trying to get to story time! 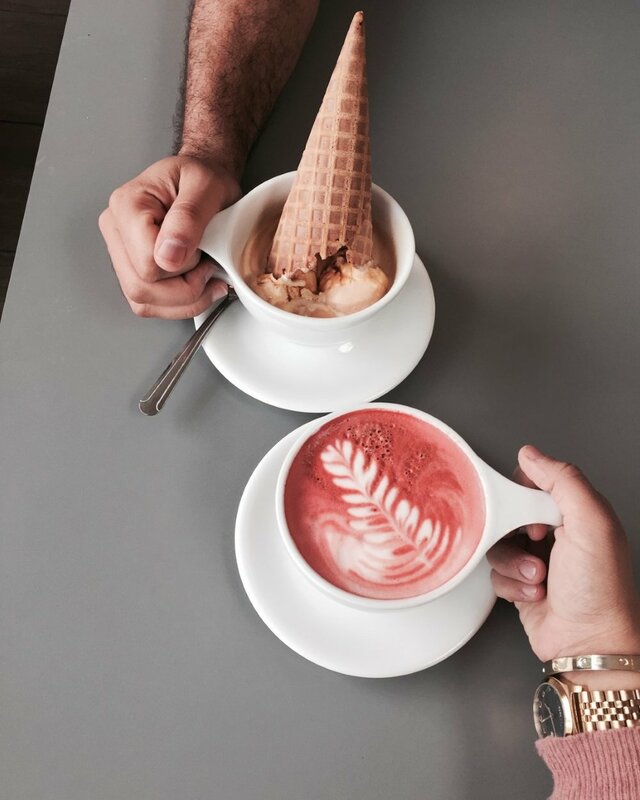 Well, I went for the Red Velvet latte and had already decided I was going to wear a pinkish top to match (for Instagram: pictured above) but my husband always tries something fun when it comes to coffee, so I was super excited when his affagato came with a cool ice cream cone to compliment his drink. It made for a perfect His & Hers combo! They also do some fun funky flavored lattes like birthday cake, lavender, nutella, chocolate mint. Oh, and we also got there famous condensed milk toast. So good! Enjoy! Ok, so another wallpaper background coffee spot but hey it is for Instagram! I love there black & white themed wallpaper and tables as well as there coffee mugs. I ordered a cappuccino here, but my husband ordered an iced coffee which was perfect for a warm day in the city, although he was too busy drinking it (and wasn't picture worthy anyways) so it's not pictured above. They also do some yummy brunch treats like avocado toast or salads if you are ever in the area. Last but not least, the place that got me addicted to Coffee! 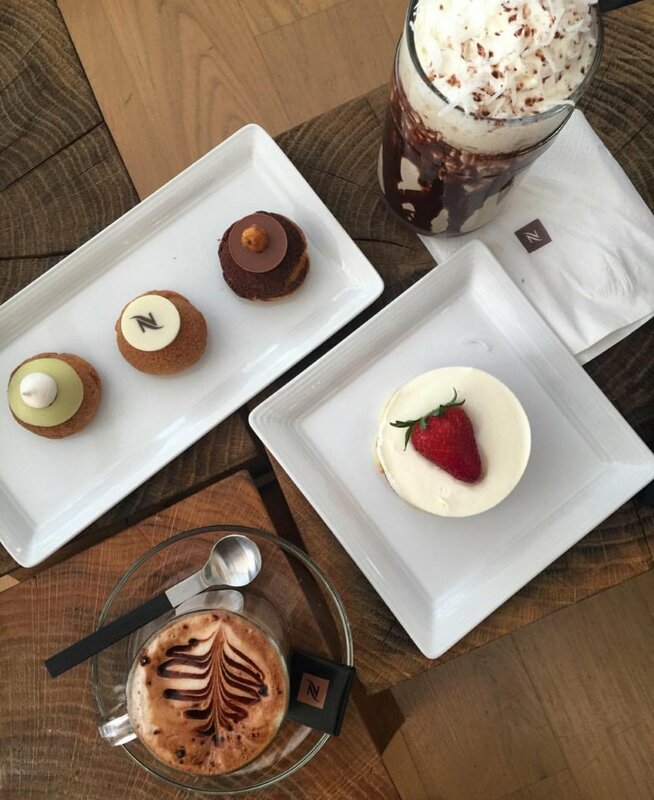 I love the coffee here, the city life ambience with a touch of luxury. We used to go for a drink called "Hazelino" which literally tasted like a Ferrero Rocher milkshake, (major hazelnut lover!) Although they stopped doing that particular one (nut & allergy reasons) we still go for there "flavor of the month" drinks to change up our tastes buds. We like to go on the weekends early morning before it get's too busy while snagging a city view table. It can get a little pricey so we like to go as a treat, however, they also sell there coffee machines and capsules downstairs so you can enjoy your own latte at home!